With pharmaceutical companies spending billions of dollars annually to aggressively promote their products directly to consumers, the public are constantly bombarded about the "benefits" of certain medications and treatments - which largely promote increased health, virility or helping us to just feel "better". With this in mind, any time a consumer purchases an over-the-counter medication or a prescription drug, they expect it to be safe and to work as advertised. Unfortunately, many of the drugs currently on the market can be quite dangerous to some users. If you or a loved one has been seriously injured by a dangerous drug you may have grounds to file a mass tort lawsuit. Medical bills, lost wages, pain and suffering and other related expenses can have crushing effects on injury victims and their families, which may be recovered through injury litigation. To find out how we can help, call us today at (865) 247-0080 or simply fill out the free, "Case Evaluation" form located to the right. Since 1997, pharmaceutical companies have been allowed to advertise their products directly to consumers - which has since created a very competitive marketplace which is often flooded with medications that may not be ready for mass consumption. Despite being regulated by the Food And Drug Administration, in many cases, clinical trials for drugs are not long enough to discover the adverse side-effects before they are put on the market - which can cause serious side-effects or long-term damage to a person. The use of these pharmaceutical drugs can sometimes lead to death. The FDA plays a regulatory role in approving and monitoring the safety of a drug after its approval; however, in the end, it is the manufacturer that is responsible for any injuries or deaths that the medication may cause. Here at Greg Coleman Law, we are sympathetic to personal injury victims, and have a strong belief that irresponsible people, companies and corporations should be held accountable for their negligence. In many drug injury and mass tort lawsuits, the manufacturer will often employ every tactic at their disposal to try to remove or minimize any possible compensation payouts to victims that have used a drug that they have produced and sold. Our team of skilled attorneys are aware of these tactics and are not afraid to confront these companies to fight for the rights of our clients. We have a hard-won reputation of representing injury victims just like you - not large firms and corporations - and have the determination to obtain the MAXIMUM compensation amount possible for each case that we handle. What Are The Costs To Hire Your Attorneys? At our firm, we believe that everyone should have access to comprehensive legal care. With that in mind, we work on a contingency-only basis. What that means is that we only charge you for our fees and services if we obtain a verdict or settlement for you. For those that are unsure if they have a case, we also offer a 100% FREE initial case review. This allows our potential clients to send us the details about their injury, which our lawyers will then review to determine if you have grounds to file a lawsuit or not. If so, we will advise you on the best way to move forward with proceedings and guide you through each step of the litigation process. If you or someone you know has suffered an adverse side effect from a drug, contact our mass tort lawyer today. Having recovered hundreds of millions of dollars in compensation for our clients, we have the knowledge and experience to handle your mass tort injury litigation and are ready to help you NOW. 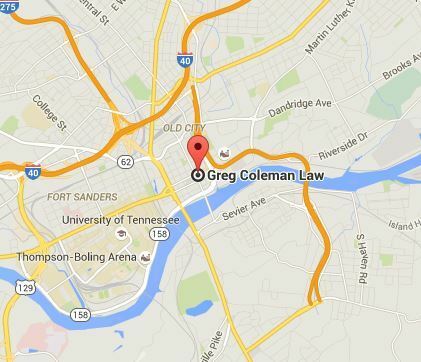 With our main office located in Knoxville, we provide thorough legal counsel to injury victims throughout Knox County - with our attorneys being licensed to practice law across the entire state of Tennessee. To find out how we can help, please contact us on (865) 247-0080 and a member from our intake team will collect some of the details about your case and then promptly connect you to one of our attorneys to discuss the merits of your claim. If you would like to start immediately, simply click "here" and complete the complimentary "Case Evaluation" form. It's free to send and strictly confidential.